Sending astronauts to Mars will present a host of healthrisks, from radiation showers to sheer boredom. One of the biggest threats isthe extra-fine dust that coats the planet. And the problem is, researchers havenever had any sample of the powdery grit to study, so they don't know exactlyhow it behaves or what its health effects might be. Two enormous dust stormsraging on Mars now serve to remind scientists of the threats facing futureMartian explorers. Among the concerns: Astronauts could get a real charge outof simply walking around. When a manned mission arrives at Mars, a goal PresidentGeorge W. Bush set for NASA, dust could coat equipment like electrostatic spraypaint, short out electronics in a spacesuit, or even zap a craft and preventastronauts from coming home. Meantime, inhaling the tiny particles will havepotential health consequences that are unknown today. "The surface dust on Mars is probably 50 times finerthan on Earth," said John Wilson, a planetary scientist at the National Oceanic &Atmospheric Administration in Princeton, New Jersey. Because theultra-fine dust exists in an extremely thin and dry atmosphere, Wilson andother scientists think it poses some unique problems. "If you walk through, pick up or simply touch thedust, it would gather charge and stick to you. We've already seen this onthe rovers' wheels," said Geoffrey Landis, a physicist with the NASA Glenn Research Center in Cleveland, Ohio. "Things get even more interesting whenwinds come by and separate the charge." Landis explained an astronaut would be a walking electricfield and attract even more dust to thespacesuit. The theoretical phenomenon is known as the triboelectric effectand is similar to the current generated while walking across a carpet floorduring the winter, when the air is extremely dry and can't soak up staticcharge well. "As you walk, you scrape off electrons in the carpetand into your body. When you reach for the door's handle, those electrons jumpand create an arc," he said. Such a zap of electricity during a Marssurface mission could damage sensitive electronics in a spacesuit or aboard a landingvehicle unless precautions were taken, he explained. "Very finely pointed needles can help leak off built-upcharge to the atmosphere, which is what is on both of the Mars Exploration Rovers,"Landis said. "For a human explorer, though, this is a materials scienceproblem. Suits will have to be designed out of poorly conducting material socharge doesn't build up easily." After a scientific foray across the Martian landscape,astronauts will then have to worry about contaminating their precious habitatwith dust. Russell Kerschmann, a pathologist at the NASA Ames Research Center in California who is studying the effects of mineral dust on humanhealth for future lunar missions, thinks Martian dust couldbe dangerous due to its fineness and unknown chemical makeup. "If dust particles are too big, they won't make it deepinside the lungs" where most lung-based diseases and disorders originate,Kerschmann said. Still, in gravity only 38 percent of the Earth's, the dust mayhang around in living spaces longer and penetrate more deeply into astronauts'lungs if particles are small enough. Kerschmann noted that an upside to Martian dust is thatbillions of years of wind erosion have most likely polished the dust grains toa minimally toxic level. "The more weathered a dust grain is, the more sphericalits shape is and the less toxic it is," he said. Kerschmann thinks moon dustis at the other end of the spectrum: Its dust particles are jagged, glassyshards created by meteorite impacts and haven't been weathered a bit, sincethere is no lunar wind. "There's some evidence people are allergic to moon dust.Astronauts and ground crews who came into contact with it complained of nasalcongestion and irritation," Kerschmann said. As for the ultimate threat of Martian dust to humans,Kerschmann was confident in the fidelity of a mission to Mars. Even if the dustis chemically toxic, he thinks engineers will be clever enough to work aroundit. "It should not be a show stopper as far as a futuremanned mission is concerned," he said. Once astronauts weather their Martian sinus infections andgather a trove of information about the red planet, they'll need to return homesafely. David Beaty, chief scientist for NASA's Mars Program, said this stepmay be the most dangerous to a manned mission's success, as dust storms on Marscan engulfthe planet in just a few weeks' time and last for months. "There's been a lot of discussion about whether itwould be possible to launch from the surface in the middle of a storm, but ourscientists just aren't sure about its effects," Beaty said. Yet at less than 1 percent the density of Earth'satmosphere, Beaty thinks Mars' thin atmosphere shouldn't have a major effect. "Martian wind speeds are about 10 to 15 meters persecond (33 to 50 mph), but there's not a lot of mass moving," he said. 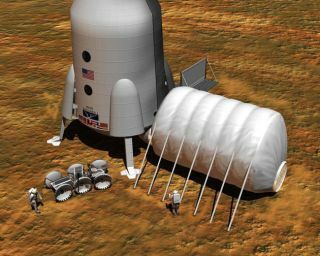 If dust storms didprevent departure, however, Beaty said being stuck in a Mars habitat for monthswould be a real problem. "It could also compress a sensitive window fordeparture back to Earth," he said. Beaty and other Mars scientists firmly believe returning intact samplesof Martian grit will be essential to a future manned mission's success. "We haven't done as much research on Martian dust as we'dlike, and it's because we don't have a sample," Beaty said. He said therovers and other spacecraft have returned invaluable information, but more isneeded. "Could Martian dust cause corrosion? Short ourelectronics? These are open questions," Beaty said. "We don't knowwhat it's made out of, and we needto know in order to optimize the safety, performance and cost of a mannedmission to Mars."